Sally Allen has always loved books, almost to a fault. At the age of eight, she was nearly sent home from a friend’s birthday party for reading during the festivities. Allen is an avid reader, writer, college instructor, book group moderator, and founder and editor of the book news website, Books, Ink at Hamlethub. Allen’s parents, both reading enthusiasts, encouraged her to embrace books from an early age. She credits her favorite childhood reads, such as E. L. Konigsburg’s From the Mixed Up Files of Mrs. Basil E. Frankenweiler and Frances Hodgson Burnett’s A Little Princess, with inspiring her to write. Allen holds a PhD in English Education and a MA in English Literature and has taught expository writing, literature, and communications to undergraduates at New York University, Fairfield University, and Post University. In addition, the author facilitates private book group discussions. Her writing about books has appeared in print and online magazines and news sites. Allen’s experiences as a reader, writer, and teacher collectively led her to the creation and release of Unlocking Worlds. “I’m excited to appear at the Ridgefield Recreation Center to share ways in which books can enrich lives and improve health. 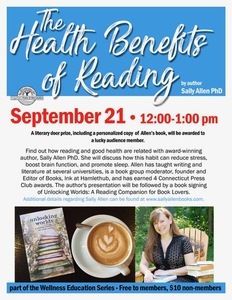 My joy -- whether through writing my book, serving as Editor of Books, Ink, or leading presentations such as this Wellness Education Talk -- is to generate conversation with and among book lovers,” said Allen. For more information on Unlocking Worlds: A Reading Companion for Book Lovers or to book the author for an appearance, visit www.sallyallenbooks.com.